Hi, it’s Gini – I am so excited that Jillibean Soup is part of the Hampton Art family, because their line is so cute! I had to have this Southern Sweet Pea stamp as soon as I saw it. And making a seed packet to go with it, seemed like the perfect spring project. 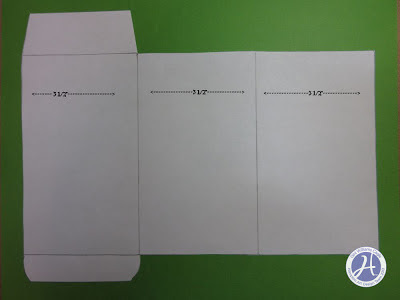 To make the seed packet, cut a piece of cardstock 10 1/2" x 8 1/2". 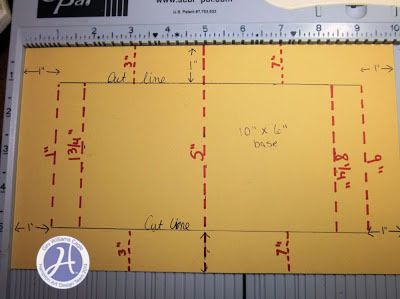 Score at 3 1/2" and 7" to divide the paper into thirds. Turn the paper and score at 1" and 7". Trim the paper as shown. The center section is going to be the front of your packet, so fold the outer panels in towards the center. Put adhesive on the far right panel, and adhere to the back of the far left panel to form the packet. At this point, ink all of the edges, and add decorative paper to the front and back of the packet. Fold the bottom tab up to the front and adhere with the Xyron Mega Runner. Punch holes on the upper tab and the packet below it to run a ribbon tie through it. 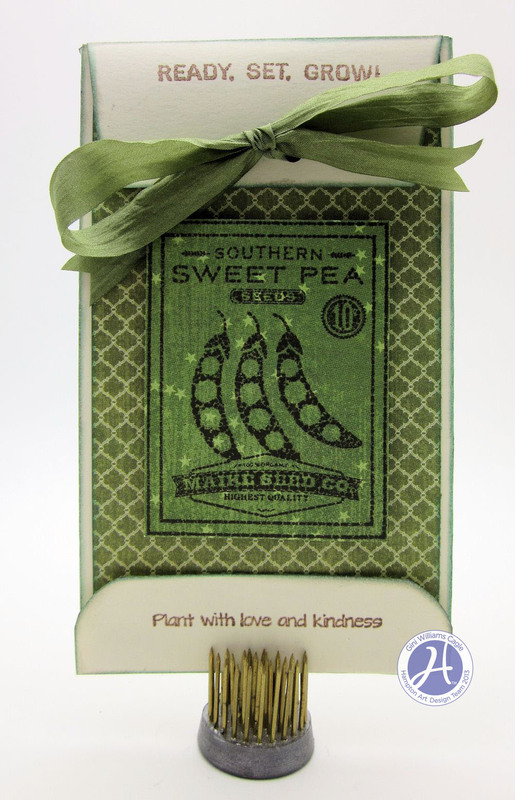 Stamp the Sweet Pea image onto a lightly patterned paper. 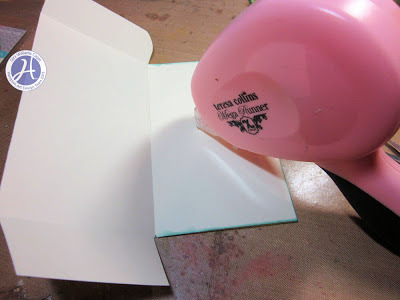 Cut the image out, and adhere to the seed packet with foam adhesives. 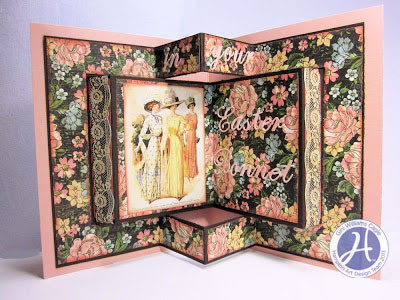 I've got a fun and different fancy fold card to share with you today! And the great part - it's super easy to make! The outside looks like a normal card, but there's a surprise on the inside. 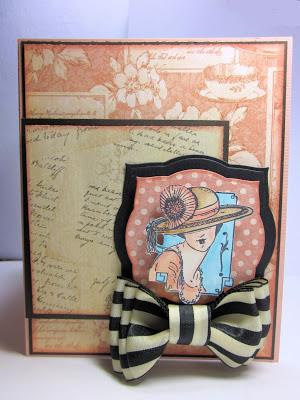 I love the Graphic 45 Ladies Diary stamp that is on the front of the card! It looks so gorgeous with the matching papers. To make the inside of the card, cut a base 10" x 6". You are going to cut two slits in the paper, parallel with the long side of the paper. Measure down and inch and over an inch, and cut an 8" cut. I think you will understand the cuts and scores more if you look at my diagram. The black lines indicate where to cut and and dotted red lines indicate where to score. As you can see, you are going to score all the way from top to bottom at the 5" mark. At the 3" and 7" you are only going to score the one inch strips at the top and bottom. The center portion will be scored at 1", 1 3/4", 8 1/4", and 9". The small bands are going to pop out and the larger center section will fold in. Decorate this base as you desire. 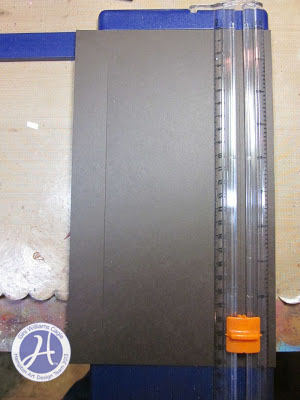 Cut a card base slightly larger than the inside (10 1/2 x 6 1/2). Score at 5 1/4. Use Scor-tape to attach the folded paper to the card base, but make sure you only add the tape along the two outer sides, and horizontally along the 1" border just to the first fold on each side. If you glue down any more, the card won't pop out like it is supposed to. Add your card front, and you are all set! All wonderful, Gini, but that fun fold one is AMAZING!